It’s Apple Day and time for the Barnes family to set up their annual apple shop. Everyone pitches in, and Dumpy the Dump Truck wishes he could help too. Finally Dumpy finds the perfect way to make Apple Day a success! 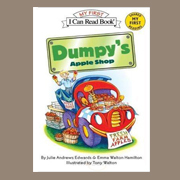 Readers will enjoy discovering how special Dumpy is and how he makes each day joyful in this easy-to-read book.